Varicose veins are due to chronic venous insufficiency (CVI), which leads to weakening of the valves in the superficial veins of the legs. Valves normally keep venous blood flowing towards the heart. 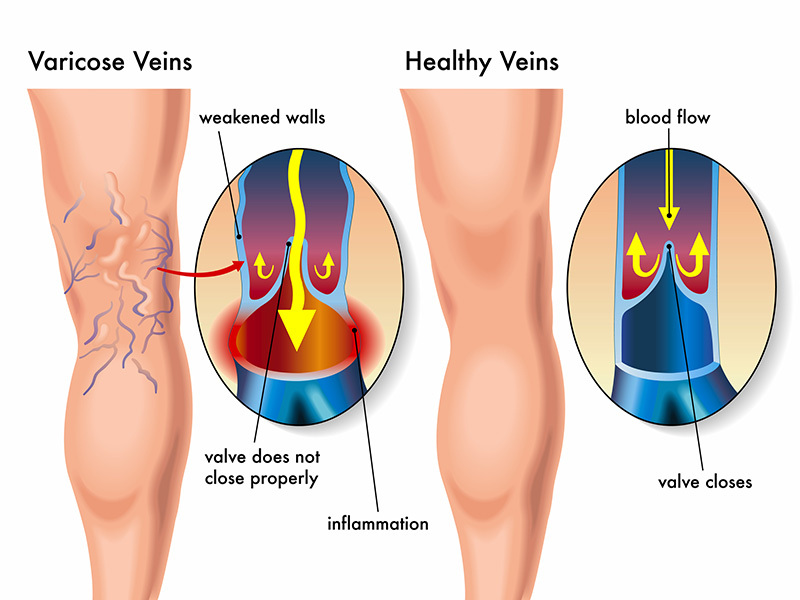 When valves are no longer functioning properly, blood flows backwards and pools in the legs. This can cause inflammation, venous dilatation, and leg pain. Severe cases can cause swelling with skin breakdown and ulceration. Venous insufficiency affects up to 25% of women and 10% of men. Symptoms include leg aches, fatigue, throbbing, heaviness, and night cramps. It can lead to unsightly bulging superficial veins and ulcers. Any of these can interfere with daily living and quality of life. In addition to a history and physical, vascular ultrasound exam is needed to look for the refluxing superficial veins. Initial treatment and symptom control may include medical grade compression stockings and wound care. However, this usually does not provide long-term relief because it does not treat the underlying problem. Vein closure is usually needed to significantly improve symptoms and provide long-term relief. This prevents reflux in the superficial venous system. This can also decrease the visibility of bulging superficial veins. 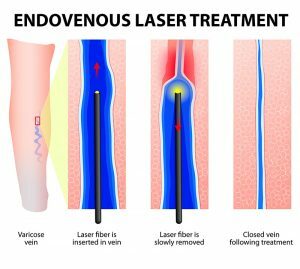 Minimally invasive, non-surgical treatment for incompetent refluxing superficial veins of the legs. The procedure is performed as an outpatient by a physician trained in treating venous disease. A small catheter is placed in the abnormal superficial vein after local anesthesia. The catheter is then carefully advanced to the highest point of reflux in the vein. The catheter is turned on and slowly pulled back through the entire length of the vein. Adequate heat energy applied to the vein causes vein contraction and closure. The entire procedure usually lasts less than an hour and requires only local anesthesia. You will be encouraged to ambulate immediately after the procedure, and most people can resume normal activities the same day. Minimal bruising and mild soreness responds well to over the counter pain relievers. Medical grade compression stockings will need to be worn for about 2 weeks. Follow up ultrasound exam will be performed some time shortly after the procedure and then yearly thereafter. Initial clinical success reported in greater than 95% of patients.